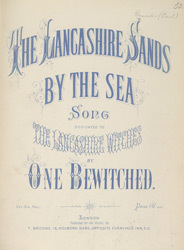 Sheet music was very popular during the Victorian period, it was very important to the working classes and in places like Lancashire, weavers and other workers who had flexible working hours took time off to practice and worked night shifts to make up their hours. Lunch and other breaks were often dedicated to rehearsals and long distances would have been travelled to attend concerts and performances. Sheet music was originally very expensive for the working classes and often people would copy the music out by hand so that they could practice.